That's Another Story: Learning from Picture Books: Any Questions? Learning from Picture Books: Any Questions? This book has a story within a story, which is always fun! I love what the author says about using your imagination to come with story ideas. It's a good book to inspire young writers. Many children want to know where stories come from and how a book is made. 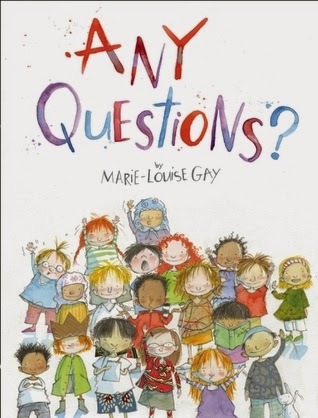 Marie-Louise Gay’s new picture book provides them with some delightfully inspiring answers though a fictional encounter between an author and some very curious children — together they collaborate on writing and illustrating a story. Marie-Louise Gay has scribbled, sketched, scrawled, doodled, penciled, collaged, and painted the words and pictures of a story-within-a-story that show how brilliant ideas creep up on you when you least expect it and how words sometimes float out of nowhere, asking to be written. Any Questions? presents a world inhabited by lost polar bears, soaring pterodactyls, talking trees, and spotted snails, with cameo appearances by some of the author's favorite characters — a world where kids become part of the story and let their imaginations run wild, becoming inspired to create tales of their own. At the end of the book, she provides answers to many of the questions children have asked her over the years, such as "Are you Stella?," "How did you learn to draw?," "Can your cat fly?," and "How many books do you make in one day?" Any Questions? by Marie-Louise Gay, Groundwood Books, Toronto, 2014. This book is partly about how to create stories, and partly an entertaining story with a story-within-a-story structure. I thought it was really great at showing how ideas can build into a story, and how sometimes it can take time for a story to emerge. It was very nice the way it showcased some of the elements that might spark a story for an illustrator, too, e.g., the colour of the paper. This is a wonderful story to spark imagination. This story may require several readings to give students a chance to study the pages and the many interesting parts of the illustrations. This would be a great story to use before getting student started on some collaborative creative writing. On Marie-Louise Gay’s blog, she gives us a glimpse behind the scenes and between the pages of Any Questions?. She says, “I wanted my story to be playful, magical and surprising. I didn't want it to be a book that tells children how to write, but rather to discover that there are many ways of writing and telling stories.” I also liked the questions she answers about herself at the end of the book (questions she often gets from students during author visits). Students will find these interesting. This book sounds fantastic! I hope I can get it from our library. Thanks for introducing it to us. I've seen this on our library shelf and have been meaning to read it. Now I will! thanks for your wonderful review. I have thought about a PB with this them. It's wonderful someone has written a book for children about writing stories. I can't wait to read it. I really enjoyed your review. Just read this - beautiful!!! Loved your review on this book. I wandered off reading about the behind the scenes and between the pages. Very interesting. Thanks for sharing, Andrea. Love those sweet faces on the cover! I will ask our library to get this book. Thanks! Oh, This is another great PPBF list. Thanks for sharing this one. It's new to me. Thanks for your insights. I'm eager to read this now! This sounds delightful, Andrea! And a good one to pair with something like Aunt Isabelle Tells A Good One!